FG Trading has a knack for discovering and introducing inventive solutions to the South African market and their recent investment into supplying the Neptun Quick series is no exception. Designed to transform the way in which glass is processed for shower screens, doors, partitions and similar frameless glass applications, the Quick series is fast, automated and efficient. The Neptun Quick series is available in a number of different modules which can be mixed and matched according to client specifications and budgets. The Quickmill and the Quickdrill deliver the drilling, milling and polishing of cut-outs, QuickFlow is the programming layer which brings the machines together and directs the entire process, and these systems can be integrated with the Neptun washing machine, dryer and a straight-line edger to completely optimise and streamline production. “The Quick line has been met with a lot of local success. We have already installed the entire solution – from drill to dryer – in a number of South African organisations and they are extremely impressed with the results,” adds Stuart. “The primary feature of this line is that it is vertical and the glass is completed to incredibly high quality standards without excessive handling,” says Stuart. “On a complete line, when the glass is loaded onto the input conveyor it is automatically controlled and handled right up to the point where it needs to enter the tempering furnace when ordinarily this would have meant handling a piece of glass through three to four different stations, manually. Alongside improvements in handling levels and quality, the series is cost-effective. Machines can be purchased as individual units and their modular nature allows for them to operate as a line or independent of one another, which not only allows for functional control, but also fits within limited budgets. Of course, the line has another ace up its sleeve beyond automation and control – speed. A cut such as the Mickey Mouse cut-out (also known as bunny ears) takes 84 seconds with the Quick line, from start to finished, polished and dried product. Normally this would take an average of 10-15 minutes using equipment available on the market today. The segment has traditionally not been as well catered for in terms of product ranges and diversity, making the Neptun series a strong contender for first place in quality and functionality. 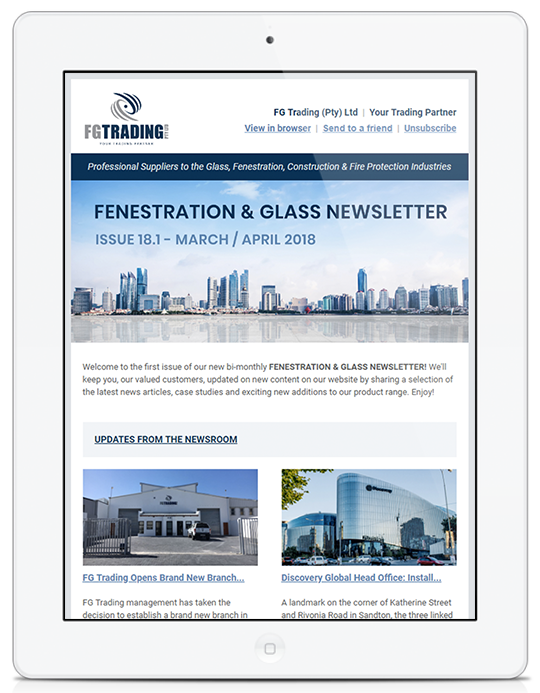 FG Trading has seen impressive results with clients who have invested in the Quick line, as well as others they have brought into South Africa such as the Rock Straight-Line Edgers and LV Top and Superinox vertical washing machines. FG Trading is also the provider of Neptun washing machines, both the top of the range Superinox and the LV Top, which can achieve speeds of up to 8m per minute and are constructed from high-grade stainless steel to extend their life span, and incorporate energy-efficient control systems.